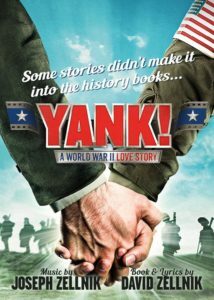 “YANK!” is a musical about a young man who is drafted in 1943 and put into basic training, where he has a dalliance with one of the soldiers. He then takes a job writing for a military magazine called “Yank.” His romance is short-lived, as they are found out. From here, we find out how brutal the military was in its treatment of soldiers for being gay. It all comes to a sad end, but not without hope for the future. Writers David and Joseph Zellnik are incredibly smart in mixing comedy and uplifting music to cushion the reality of the story. At times, it is a tribute to the 40s war movie musical.